Michael Cohen is director of Emory Breast Imaging Centers. 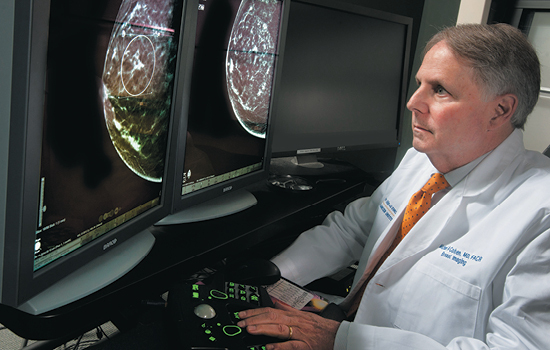 Emory inaugurated 3D mammography, or digital breast tomosynthesis (DBT), imaging technology for regular screening mammograms because it is more accurate at detecting breast cancers and produces fewer false-positives that result in patient call-backs. But when a woman is called back and additional mammograms show something that could be cancer, the next step is a biopsy to sample a tiny bit of tissue from the suspected area. Every stage of this process, and any subsequent treatment, is extremely dependent on accuracy. Now, doctors within Winship's Glenn Family Breast Center are using 3D technology throughout the screening and biopsy process. Some breast lesions and calcifications may be subtle and visible only on 3D imaging, so using the technology to guide biopsies enables physicians to more accurately pinpoint and mark areas that may prove to be small, treatable breast cancers. The new Affirm 3D biopsy system is being used at Winship breast imaging facilities on Emory's Clifton Campus, Emory University Hospital Midtown, Emory Johns Creek Hospital, and soon will be at Emory Saint Joseph's Hospital.